Um, guys, it is November. NOVEMBER! The year is nearly out and it is time to kick it up your social life a notch. This weekend in Brisbane is jam-packed with festivals, foodie utopias, puppies, plays, and parties for you to cram into your weekend. Quick, there is no time to waste, Myer is already playing Christmas carols! Here are the best things to do in Brisbane this weekend. Dog lovers of Brisbane gather round, for we have yet another event coming up that is entirely devoted to pooches. Seriously, there will be so many pups running about you will be petting, playing fetch, and teaching tricks all at once with the cutest dogs in Brisbane. There will be a breed showcase, celebrity vet stage with professional pup-lover/heartthrob Dr Chris Brown, as well as a dog adoption zone for you to expand your family. A Russian film festival is kicking off this weekend and we here at the Urban List are ready to soak up a little East European culture. A careful selection of 14 films will be screening to show a smorgasbord of what the Russian film industry has achieved over the years. Stop by for a slice of the Russian life. Looking for some inspiration to free you from the daily corporate grind? Margie Parsons is here to share her story of entrepreneurship and following her passion for business. She will be showcasing her success in her small business Woodblock Cheese, available as a resource for any budding entrepreneurs in Brisbane. This event ends Friday, so be quick! Alf’s Place will be wrapping up their Three Little Pigs Vietnamese Supper Club this Saturday, and we urge you to check them out before you miss your chance! Serving up their classic Vietnamese style cuisine with a twist, they have three set menus for you to choose from. Whether you go for the pork ribs, Banh Mi, or are a Buddha bowl lover, this supper club is not to be missed. The inspiring vocal talent of Amanda Canzurlo, aka Bloom, has hit the road to bring us The Adele & Amy Songbook. Covering two iconic British artists, Bloom will bring the music of Adele and Amy Winehouse to life with her soulful tone to serenade you through the perfect Friday night. Celebrate Latin American culture in Brisbane’s own ‘Dia de los Muertos’ themed festival! Learn about the cultural beliefs and aspirations while enjoying a day full of food, music, and art. The live music will all be performed by local talent and there will be a dance floor to complete the mood. Muchas gracias Fiesta Latina! Spend your Saturday taking care of your physical and mental wellbeing at Brisbane’s YogaFest. Participate in an array of yoga classes run by Australia’s best teachers to kick off your day and align your chakras. Experience wellbeing presentations on a range of subjects that are sure to enlighten you. On top of all this, there will be live music, stalls, and plenty of nutritious and delicious food and drink hubs to keep you energized throughout the day. Welcome to Brisbane’s coolest block party, The End Of The Line Festival. The festival celebrates the unique urban landscape that is Woolloongabba by extending their restaurants onto the street and inviting you to join them. Jurgens Street will be transformed into an urban street festival, packed with live music stages, food trucks, art installations, and plenty of activities to partake in throughout the afternoon. Kicking off this Saturday is our childhood fave The Wizard of Oz live stage musical. QPAC will be hosting this show of nostalgic merriment adapted from the original screenplay to fit the stage. If you are tired of the classics there will also be a few new numbers thrown in written by the great Tim Rice and Andrew Lloyd Webber, just to spice things up in the Emerald City. Put on your red shoes and dance the blues at this year’s David Bowie party in Brisbane! Dress as your fave Bowie look (I’ll be going as Jareth the Goblin King, obvs) and bowie down to the greatest hits of Ziggy Stardust. Classic jams by the likes of Queen and The Rollingstones will wrap up the night, so stop by for a listen of the most iconic songs of our recent generations. Put the kettle on this Sunday and learn all you possibly can about the ancient art of tea. Become a pure leaf tea expert as you learn the origins, history, types, and styles of tea that go into making the perfect cuppa. There will, of course, be plenty of tea drinking paired with snacks from Indie Treats to enhance your tea tasting experience. Pinkies up! Yayoui Kusama’s utterly phenomenal art is gracing Brisbane starting this weekend, and we don’t want you to miss out! Life is the Heart of a Rainbow focuses on a range of her work spanning the 60 years she has been an active artist. Take a look at some of her most iconic works as you wander through the exhibit exemplifying her life and art. Alright, so this one is a couple of weekends away, but seats are booking up fast and we don’t want you to miss out on what is to be a truly amazing evening! Spicers’ Chefs In The City will be concluding on the 19th of November, and they will be going out in style. Enjoy a seven-course degustation prepared by multiple credited chefs while you relax under the stars, wine in hand. Each head chef will be serving their best dish of 2017, giving you a smorgasbord of the crème de la crème in Australian dining this year. Book tickets soon so you don’t miss out! Brisbane’s trendiest wine bar will be teaming up with Spokenwine and Quealy Winemakers to host their first bi-monthly winemaker event. The first in an ongoing series, this event will showcase quality Australian wines paired with the stunning French-inspired cuisine of the Greenglass restaurant. Prepare for an elegant evening overflowing with great food and phenomenal wine. Day of the Dead is coming and to celebrate Port Office Hotel is putting on a Mexican Fiesta thanks to Espolon Tequila. There’ll be delicious cocktails (aka margaritas) all month long, so head down with your mates and get ready to celebrate. Drink responsibly. 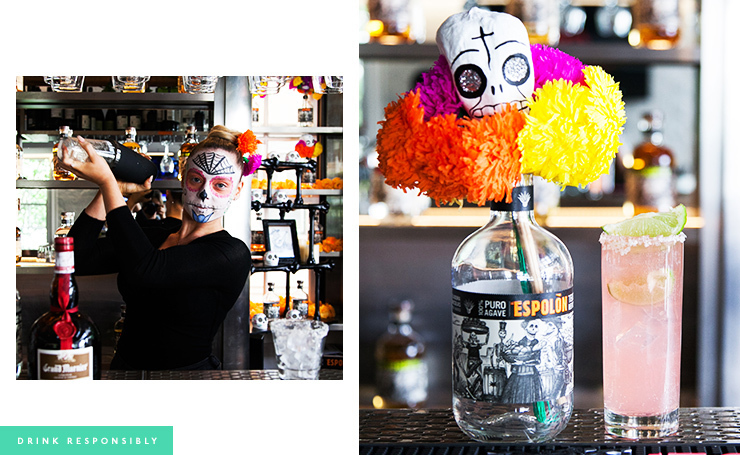 The crew over at Eatons Hill Hotel have gone wild for Day of the Dead and are celebrating by throwing one huge fiesta with Espolon Tequila. There’ll be a photo print station and live face painting so head down with your whole squad and get amongst it. Drink responsibly. This month at The Envy is all about Espolon Tequila. There’ll be ice-cold cocktails (think batangas and margaritas) available at the bar, as well as face painting and a photo print station this Saturday only! We suggest you head to The Envy, order a cocktail and settle in with your mates for the night. Drink Responsibly. For all the best happenings in Brisbane, check out upcoming events here. Editor's note: Espolon Tequila's event is proudly sponsored by Campari and endorsed by The Urban List. Thank you for supporting the sponsors who make The Urban List possible. Click here for more information on our editorial policy.